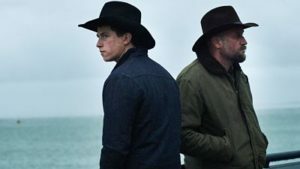 The 2015 French-Belgian Western drama Les Cowboys is the directorial debut of prolific screenwriter Thomas Bidegain (A Prophet). Finnegan Oldfield and Francois Damiens in Les Cowboys. In a vast Western prairie somewhere in the east of France. Alain (Francois Damiens) is a central figure in the community. He’s dancing with his daughter, Kelly (Illiana Zabeth), 16, as his wife and their young son, Kid (Finnegan Oldfield), watch from the sidelines. But on this day, Kelly disappears, and the family falls apart. Alain embarks on a relentless search for his daughter, even though it costs him everything and takes him to some far-off places. His sole support is Kid, who sacrifices his youth to accompany his father on a seemingly endless quest. Les Cowboys received very positive notices from the critics upon its limited theatrical release in the U.S. this past June, earning an 86% positive rating at Rotten Tomatoes based upon 36 published reviews.